Last night I decided to make it a mild night, so I rented The Bucket List and knit on the first Pismo hat. This is about how far I got last night. Not very far. Again, another reason to not like sock yarn…progress is sloooow. I’m a project knitter, folks, so I want it done now! I think I liked The Bucket List, though. I had a different idea in my head of what it was going to be about. But I think I liked how it was done rather than what I thought was going to happen. I actually think that having a list like that is a good idea. I have one (in my head–I should write it down), my Summer BFF has 101 things on his….I heard once that people who write down life goals tend to accomplish them more than people who don’t. Maybe we should all get to writing down some of those things we want to do before we "kick the bucket". And we never know when that’s going to be, so get cracking at crossing things off too! I agree. I never write goals down and I think we should. Your even more motivated when it’s blogged or etc. 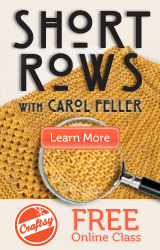 I just recently posted summer knitting goals on my blog.